In the 19 century Florence has been celebrated as the most beautiful city in Italy. For most people Florence cames close to living up to the myth only in its first, resoundin impressions. 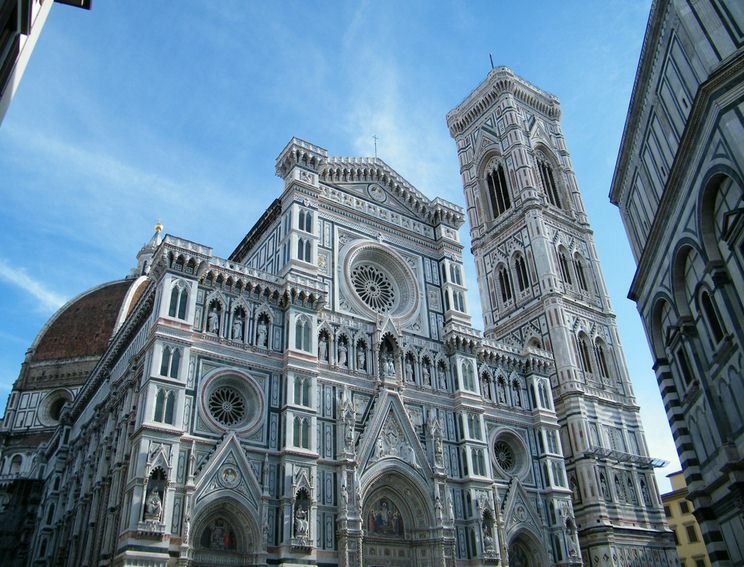 The pinnacle of Brunelleschi’s stupendous dome is visible over the rooftops the moment you step out of the central square, and when you reach the Piazza del Duomo the close up view is even more breathtaking, with the multicolored duomo with the marble clad baptistery. Wander from there down towards the river Arno and the attracion still hold beyond the Piazza della Signoria, site of the immense Palazzo Vecchio, the water is spanned by the shopladen medieval Ponte Vecchio, with georgeous San Minato al Monte glistening on the hill behind it. 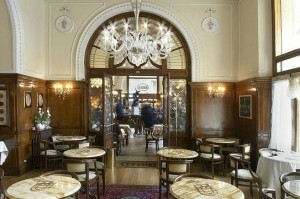 The fact is, the best Florence is to be seen indoors. 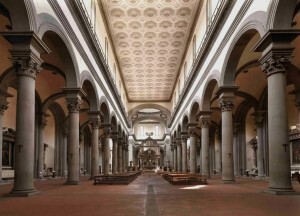 Under the rule of the Medici family – the greatest patrons of Renissance Europe – Florence’s artist and thinkers were instigators of the shift from the medieval to the modern world view, and the churches, galleries and museums of this city are the places to get to grips with what they achieved. The development of the Renaissance can be plotted stage in the vast picture collection of the Uffizi, and charted in the sculpture of the Bargello, the Museo dell’Opera del Duomo and the church of Orsanmichele. 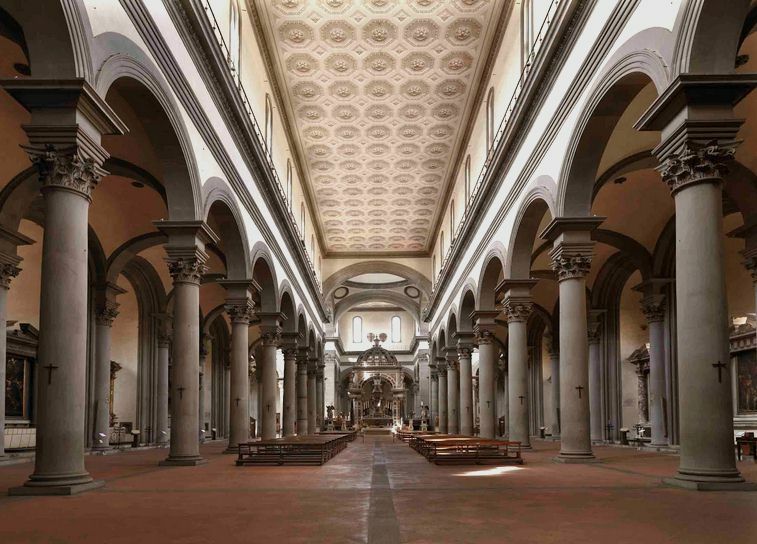 Equally revelatory are the fabulous decorated chapels of Santa Croce and Santa Maria Novella, forerunners of such astonishing creation as Masaccio’s restored frescos at Santa Maria del carmine. Fra’ Angelico’s serene paintings in the monk’s cells at San Marco and Andrea del Sarto’s work at Santissima Annunziata. The Cappelle Medicee Michelangelo’s most celebrated contribution to the San Lorenzo building’s forms part of the Cappelle Medicee. 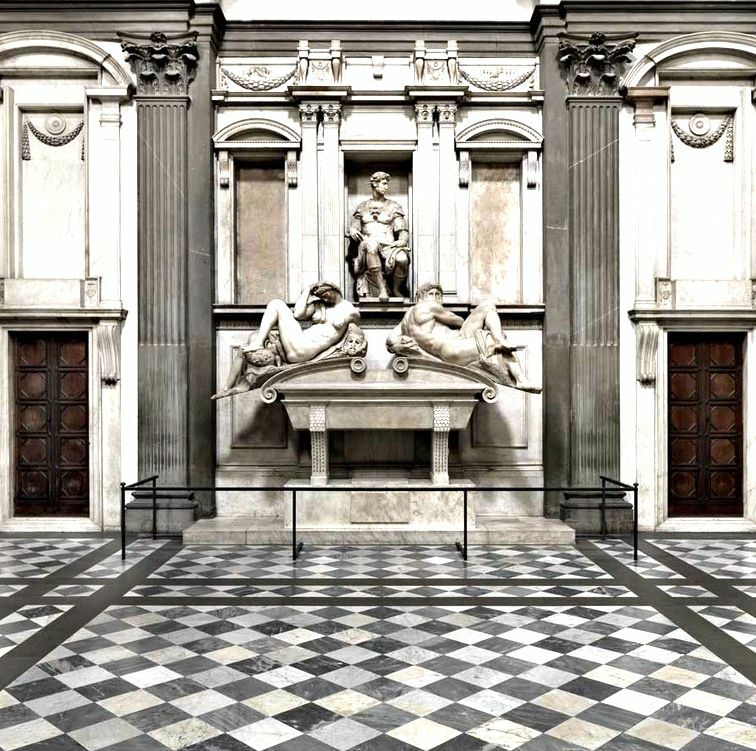 After filing through the subfuse crypt where many of the Medici are actually buried, you climb into the larger of the chapels, the Cappella dei Principi (Chapel of the Princes), a gloomy, marble-plate,1 hall built as a mausoleum for Cosimo I and his descendants. Morbid and dowdy. with tank-like tombs, it epitomizes the notion that magnificence is directly proportional to expenditure. This was the most expensive building project ever financed by the family. and the Medici were still paying for it when the last of the line, Anna Maria Ludovica, joined her forebears in the basement. It could have looked even worse — the massive statues in the niches were intended to be made from semiprecious stones, like those used in the heraldic devices set into the walls. Begun in 1520, the Sagrestia Nuova was designed by Michelangelo as a tribute to, and subversion of, Brunelleschi’s Sagrestia Vecchia. Architectural connoisseurs go into raptures over the complex cornices of the alcoves, the complex relationship between those alcoves and the plane of the wall, and other such sophistication, but the lay person will be drawn to the fabulous Medici tombs, carved by Michelangelo between 1529 and 1533.’1’o the left is the tomb of Lorenzo, Duke of Urbino, the grandson o’f Lorenzo it Magnifico; he is depicted as a man of thought, and his sarcophagus bears figures of Dawn and Dusk, the times of day whose ambiguities appeal to the contemplative mind. Opposite is the tomb of Lorenzo it Magnifico’s youngest son, Giuliano, Duke of Nemours; as a man of action, his character is symbolized by the clear antithesis of Day and Night. As a contemporary writer recorded, these are not true portraits: lie did not take from the Duke Lorenzo nor from the Lord Giuliano the model just as nature had drawn and composed them, but he gave them a greatness, a proportion, a dignity … which seemed to him would have brought them more praise, saying that a thousand years hence no one would be able to know that they were otherwise.. They were very nitidi otherwise, flattered by their ducal titles and genealogies as such as by these noble memorials action man Giuliano was an easy-going but feckless individual, while Lorenzo combined ineffectualness with insufferable arrogance. Both dieand unlamented — Giuliano being killed by tuberculosis, Lorenzo by aTonrib,ination of the same disease and syphilis. Their effigies were intended to face the equally grand tombs of Lorenzo it and his brother Giuliano; the only part of the project realized Michelangelo is :he preogcupied Madonna algid Child, the last image of the Madonna he ever sculpted. In 1534, four years after the Medici had returned to Florence in the unfathomably wretched form of Alessandro, Michelangelo decamped to Rome, where he stayed for the rest of his life. There are more Michelangelo drawings behind the altar which can be seen on supervised (free) trips every thirty minutes. Pontevecchio is a Medieval stone closed-spandrel segmental arch bridge over the Arno River, in Florence. The Cenacolo di Sant’Apollonia Running off the west side of Piazza San Marco, Via Arazz.ieri soon becomes Via XXVII Aprile, where the former Benedictine convent of SaneApollonia stands at no. 1. Most of the complex has now been turned into flats, but the former refectory houses one of Castagno’s masterpieces, the Last Supper (Tues—Sat 9am-1.50pm, plus same hours first, third & fifth Mon of month & second & fourth Sun of month; free). Painted around 1450, after the artist’s return from Venice, the cenacolo was white-washed out by the nuns, before being uncovered in the middle of the last century. It is perhaps the most disturbing version of the event painted in the Renaissance. Blood red is the dominant tone, and the most commanding figure is the diabolic black-bearded Judas, who sits on the near side of the table. The seething patterns in the marble pan-els behind the Apostles seem to mimic the turmoil in the mind of each, as he hears Christ’s announcement of the betrayal. Above the illusionistic recess in which the supper takes place are the sinopie of a Crucifttion,Depositi. and Resurrection by Castagno, revealed when the frescoes were taken off the wall for restoration. Santo Spirito Some indication of the importance of the parish of Santo Spirito is given by the fact that when Florence was divided into four adminstrative quartieri in the fourteenth cen-tury, the entire area south of the Area was given its name. The slightly run-down square in front of Santo Spirito church, with its market stalls and cafes, encapsulates the self-sufficient character of Oltrarno, an area not hopelessly compromised by the encroachments of tourism. Santo Spirito church Designed by Brunelleschi as a replacement for a thirteenth-century church, Santo Spirito church (daily 8am-noon & 4-6pm; closed Wed pm) was one of his last pro-jects, and was described by Bernini as “the most beautiful church in the world”. The paper-smooth facade is just a plastering job to disguise the unfinished front, but inside it’s so perfectly proportioned that nothing could seem more artless. Yet the plan is extremely sophisticated -a Latin cross with a continuous chain of 38 chapels round the outside and a line of 35 columns running without a break round the nave, transepts and chancel. Only the Baroque baldachin, about as nicely integrated as garden gnome in a Greek temple, disrupts the harmonics. The best paintings are in the transepts: in the right there’s Filippino Lippi’s Nerli Altarpiece, and in the left a St Monica and Augustinian Nuts by Verrocchio that’s vir-tually a study in monochrome, with black-clad nuns flocking round their black-clad paragon. Also worth a peep is the sacristy, which is entered through a vestibule that opens onto the left aisle; both rooms were designed at the end of the fifteenth century by Giuliano da Sangallo. A fire in 1471 destroyed all the monastery with the exception of its refectory, now the home of the Museo Santo Spirito (Fuel-Sat 9am-2pm, Sun Sam-lpm; (4000), a one-room collection comprising an assortment of carvings, many of them Romanesque, and a huge fresco of The Crunfixion by Orcagna and his workshop. The statue represents the Biblical hero David, a favoured subject in the art of Florence. Originally commissioned as one of a series of statues of prophets to be positioned along the roofline of the east end of Florence Cathedral, the statue was placed instead in a public square, outside the Palazzo della Signoria, the seat of civic government in Florence, where it was unveiled on 8 September 1504. 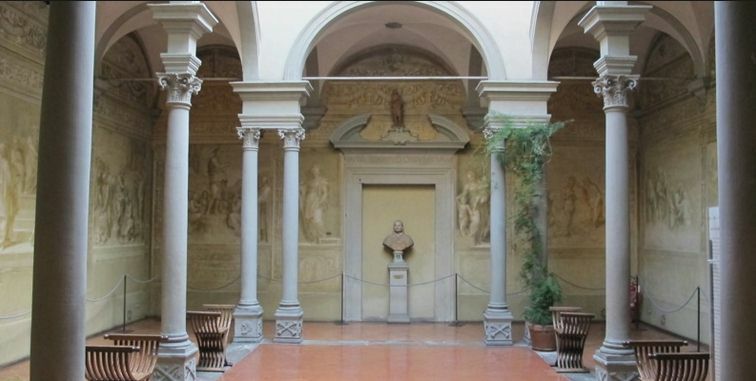 Florence’s first academy of drawing indeed Europe’s first – was founded in the mid ssixteen century by Bronzino Ammannati and Vasari. Initially based in Santissima Annunziata, this Accademia del Disegno moved as 1164 to Via Ricasoli 66, and soon afterwards was transformed into a general arts academy, the Accademia di Belle Arti. 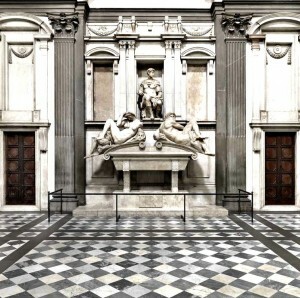 Twenty years later the Grand Duke Pietro Leopoldo founded the nearby Galleria dell’Accademia (May-Sept Tues-Sat 9am-10pm, Sun 8.30am-8pm; Oct-April Tues-Sat 8.30am-6.50pm, Sun 8.30zun-1.50pm; L12,000), filling its rooms with paint-ings for the edification of the students. Later augmented with pieces from suppressed religious foundations and other sources, the Accademia has an extensive collection of paintings, especially of Florentine work of the fourteenth and fifteenth centuries. 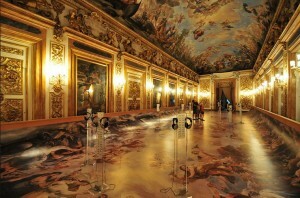 Yet the pictures are not what draw the crowds in numbers equalled only by the Uffizi. The real attraction is Michelangelo, half a dozen of whose major sculptures are here, among them the David – symbol of the city’s republican pride and of the illimitable ambition of the Renaissance artist. Finished in 1504, when Michelangelo was just 29, and carved from a block of marble whose shallowness posed severe difficulties, it’s an incomparable show of technical bravura. But the David is a piece of monumental public sculpture, not a gallery exhibit After being considered as an adornment far the exteri-or of the duomo, it was instead installed outside the Palazzo Vecchio, where it remained until 1873, when it was removed to the Accademia’s specially built tribune. Close by is another unfinished work, St Matthew, which was started immediately after completion of the David as a commission from the Opera del Duomo; they actually requested a full series of the Apostles from Michelangelo, but this is the only one he ever began. The Accademia’s picture galleries are big but unexciting, with copious examples of the work of “Unknown Florentine” and “Follower of … “. The pieces likeliest to make an impact are-Trointormo’s Venus and Cupid, Botticelli’s attributed Madonna of the Sea and the painted fifteenth-century Adimari Chest, showing a Florentine wedding cere-mony in the Piazza del Duomo. Arguably the finest Romanesque structure in Tuscany, San Minato is also the oldest surviving church building in Florence after the baptistery. It recently began to show sings of its age, though, and the authorities become so concerned about the dangers of subsidence that a project was initiated to shore up the downhillside of the church and the adjoining cemetery. 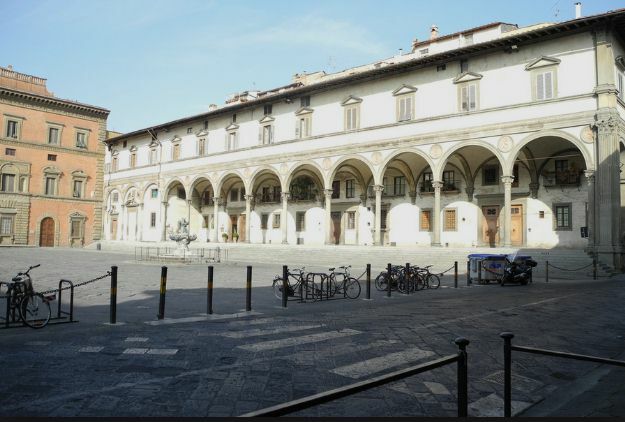 Then in a depressing rerun of the Piazzadella Signoria fiasco, it was discovered thata degree of financial impropriety may have been involved in awarding the contract; work has now been suspended for an indefinite period. The Loggia dei Lanzi, also called the Loggia della Signoria, is a building on a corner of the Piazza della Signoria in Florence, Italy, adjoining the Uffizi Gallery. It consists of wide arches open to the street. The arches rest on clustered pilasters with Corinthian capitals. The wide arches appealed so much to the Florentines, that Michelangelo even proposed that they should be continued all around the Piazza della Signoria. The Chiostro dello Scalzo ‘In the north of San Marco, at Via Cavour 69, is Lo Seat, the home of the Brotherhood of St John, whose vows of poverty entailed walking around barefoot -scal-zo. The order was suppressed in 1785 and their monastery sold off, except for the clois-ter (Mon and Thurs 9am-lpm; free; ring the bell). This was the training ground for Andrea del Sarto, an artist venerated in the nine-teenth century as a painter with no imperfections, but now regarded with slightly less enthusiasm on account of this very smoothness. His monochrome paintings of the Cardinal Virtues and Scenes from the Life of the Baptist occupied him off and on for a decade from 1511, beginning with the Baptism, finishing with the Birth of St John. A couple of the sixteen scenes – John in the Wilderness and John meeting Christ – were executed by his pupil Franciabigio in 1518, when del Sarto was away in Paris. Nineteenth-century urban renewal schemes left many of Florence’s squares rather grim places, which makes Piazza Santissima Annunziata, with its distinctive arcades, all the more attractive a public space. It has a special importance for the city, too. 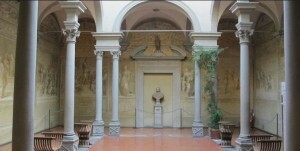 Until the end of the eighteenth century the Florentine year used to begin on March 25, the Festival of the Annunciation — hence the Florentine predilection for paintings of the Annunciation, and the fashionableness of the Annunziata church, which has long been the place for society weddings. The festival is still marked by a huge fair in the piazza and the streets leading off it; later in the year, on the first weekend in September, the square is used for Tuscany’s largest crafts fair. On the edge of the square in front of San Lorenzo stands the Palazzo Medici-M(7.1 (Mon, Tues & Thurs-Sat 9am-lpm & 3-6pm, Sun 9am-lpm), built for Cosim il Vecchio by Michelozzo in the 1440s, and the family home un61Cosimo I installed the clan in the Palazzo Vecchio. With its heavily rusticated exterior, this monolithic palaz-zo was the prototype for such houses as the Palazzo Pitti and Palazzo Stroz.zi, but in the seventeenth century it was greatly altered by its new owners, the Riccardi. Of Michelozzo’s original palazzo only the chapel remains intact, its interior covered by lively frescoes by Benozzo Gozzoli, of which the centrepiece is the Journey of the Magi, painted around 1460 and recently restored to blazing colour. It shows the pageant of the Compagnia dei Magi, the most patrician of the city’s religious confraternities; their procession took place on Epiphany, with members of the Medici usually partici-pating. It’s known that several of the Medici household are featured in the procession, but putting names to these prettified faces is a problem. The man leading the cavalcade on a white horse is almost certainly Piero it Gottoso, sponsor of the fresco. Lorenzo it Magnifico, eleven years old at the time the fresco was painted, is probably the young king in the foreground, riding the grey horse detached from the rest of the procession, while his brother, Giuliano, is probably the one preceded by the black bowman. The artist himself — almost impossible to find — is in the crowd on the far- left, his red beret signed with the words “Opus Benotii” in gold. Finally, the bearded characters in among the gallery of faces might be portraits of the retinue of the Byzantine emperor John Paleologus III, who had attended the Council of Florence twenty years before the fres-co was painted. Stairs ascend to the first floor, where a display case in the lobby of the main gallery contains a Madonna and Child by Filippo Lippi, one of Cosimo de’ Medici’s more trou-blesome proteges. Even as a novice in the convent of Santa Mafia del Carmine, Filippo managed to earn himself a reputation as a drunken womanizer: in the words of Vasari, he was “so lustful that he would give anything to enjoy a woman he wanted … and if he couldn’t buy what he wanted, then he would cool his passion by painting her por-trait.” Cosimo set up a workshop for him in the Medici palace, from which he often absented himself to go chasing women. On one occasion Cosimo actually locked the artist in the studio, but Filippo escaped down a rope of bed sheets; having cajoled him Into returning, Cosimo declared that he would in future manage the painter with “affec-tion and kindness”, a policy that seems to have worked more successfully. 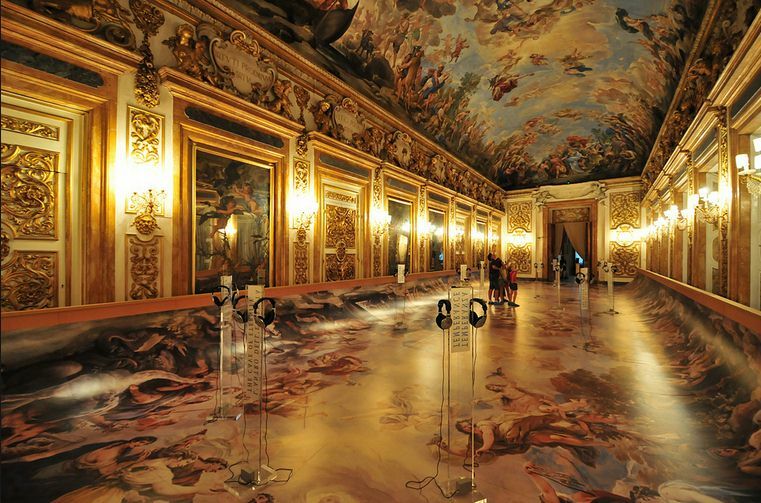 ‘Me ceiling of the main room is covered by Luca Giordano’s fresco of The Apotheosis of the Medici, from which one can only deduce that Giordano had no sense of shame. Accompanying his father on the flight into the ether is the last male Medici, Gian Gastone (d. 1737), in reality a man so inert that he could rarely summon the energy to get out of bed in the morning. 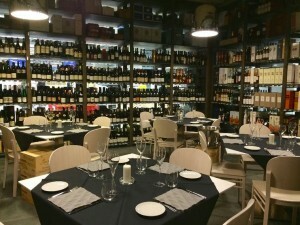 Wine bars Cantinetta dei Verrazzano, Via dei Tavolini 18-20r. Owned by Castello dei Verrazzano, a major Chianti vineyard, this is a good spot for a drink or a slice of pizza. The glass-fronted display inside oozes with outstanding pizza, focaccia and cakes – pay at the cash-desk and eat sitting on the bench provided. Otherwise, tables beyond the white-tiled oven or in the pleasant wood-lined room to the left are perfect for an early evening glass of vino. Busy at lunch. Closed Sun & Aug. Casa del Vino, Via dell’Ariento 16r. Located just west of the Mercato Cenaale, del Vino is passed by hordes of tourists daily – yet it’s probably visited by only a handful. Patrons are mostly Florentines, who pitch up for a drink, a chat with owner Gianni Migliorini and an assault on various Mobil, crostini, and saltless Tuscan bread and salami. Closed Sun & Aug. Enoteca Baldovino, Via San Giuseppe 18r. An offshoot of the excellent Scottish-run Baldovino restaurant just across the road (see p.148), this is a stylish place to buy gastronomic goodies or drink wine at the bar or one of the tables to the rear. The small menu of sandwiches, soups and home-made cakes changes daily. Very convenient for Santa Croce. Closed Mon. Fiaschetteria, Via degli Alfani 70r, corner of Via dei Servi. The university nearby ensures that this otherwise low-key place is often heaving at lunch thne, when students pile in for the pasta-and-a-salad for around 1.15.000. There’s also a fair variety of wines by the glass. Closed Sun. Fuori Porta, Via del Monte alto Croci. If you’re climbing up to San Miniato and regret your deci-sion halfway up, console yourself at this superb wine bar-osteria. There are over 400 wines to choose. ribollita soup. Unfussy it might be, but quality cooking doesn’t come cheap in Florence — most of the restaurants that meet with local approval cost L40,000-plus per person, wine included. Yet there are some decent low-budget places serving food that at least gives some idea of the region’s characteristic dishes, and even the simplest trattoria should offer bistetva alit; Fiorentina — though you should bear in mind that this dish is priced per hwidred grams, so your bill will be considerably higher than the figure mitten on the menu. Another thing to be aware of is that many restaurants will only serve full meals — so check the menu outside if you’re thinking of just popping in for a quick lunch-time plate of pasta. Asa very rough guideline, the cheapest places tend to be near the station, the best places on or near the main central streets, and the best mid-range restaurants tucked away in alleys on the north of the river or over in Oltrarno. 7 he restaurants below are defined by area — west and north of the immediate city centre (around the station, Santa Maria and San Lorenzo), the city centre, east of the city centre (around Santa Croce) and south of the river (Oltrarno). Prices are defined as Inexpensive (under L35,000 a head for three courses plus water, wine and cover charge), Moderate (135,000-65,000) and Expensive (over L65,000), but these are loose defini• dons, because you can keep costs down even in more expensive places by having just two courses (pasta and main), and retiring to a bar for ice cream or coffee and digestif, Remember, too, that you often needn’t buy a whole bottle of wine: ask fora half-bottle or quarter-bottle/jug of house wine (tnezza bottigliet or un guartino).